BACKGROUND: Improving quality of life (QoL) is a main goal of treatment in the management of elderly patients with advanced stage non-small cell lung cancer (NSCLC). Oral cytotoxic agents may offer advantages in terms of patient preference and QoL. We compared the effects of oral vinorelbine and intravenous (i.v.) gemcitabine on QoL of elderly patients with advanced NSCLC. PATIENTS AND METHODS: In this observational, non-interventional, prospective, multicenter study we enrolled 128 elderly (age ≥70 years) patients with advanced (IIIB-IV) NSCLC who were candidates for first-line treatment with i.v. gemcitabine (1000 mg/m2) or oral vinorelbine (60 mg/m2) both on days 1 and 8, every 21 days. The primary endpointwas the change from baseline in global health status/QoL after three cycles. Secondary endpoints included change from baseline in other parameters of QoL, acceptability and satisfaction with oral vinorelbine. At baseline and every 3 cycles patients were administered the EORTC QLQ-C30 v 3.0 and QLQ-LC13 to evaluateQoL. A specifically designed questionnaire was used to estimate the satisfaction with treatment among patients receiving oral vinorelbine. RESULTS: 106 patients (80 males and twenty-six females, mean age 77.1 years) were evaluable for this study. Global health status/QoL significantly improved only in the oral vinorelbine group (p < 0.05). Significant improvements were also observed in the Physical Functioning scale with both treatments, in the Cognitive Functioning scale with i.v. gemcitabine only (p < 0.05) and in the Role Functioning, Emotional Functioning and Social Functioning scales with oral vinorelbine only (p < 0.01 for all). Vinorelbine also improved several symptom scales of the QLQ-C30 and dyspnoea (p < 0.01), sore mouth (p < 0.05) and pain in chest (p < 0.01) assessed by the QLQ-LC13. Treatment with oral vinorelbine was well tolerated and associated with high patient satisfaction rates. CONCLUSIONS: Owing to comparable efficacy to traditional chemotherapy and an acceptable toxicity profile, oral vinorelbine may represent an effective first-line therapeutic option in elderly patients with NSCLC, and may also provide improvements in quality of life. Non-small cell lung cancer (NSCLC) is the second most common malignancy in Western countries, representing 85% of all lung cancers in the elderly 1. The vast majority of NSCLC occurr in subjects aged 65 years or older 2, and the incidence in the elderly population is increasing, due to the rise in life expectancy. Current guidelines do not recommend a specific first-line chemotherapy for elderly patients with advanced NSCLC, although it is acknowledged that older patients may experience more toxicity from cytotoxic chemotherapy as compared with younger patients 3. However, there is evidence that chemotherapy is superior to best supportive care even in this particular setting of patients 4. There is currently no consensus on the standard first-line treatment to be used in elderly patients with advanced NSCLC. An increasing number of trials have been published over the past few years in which the efficacy of platinum- and gemcitabine-based doublets has been assessed in elderly patients with NSCLC 5 , 6 , 7 , 8 , 9, and the results of a recent metanalysis suggest that doublets may be more effective and tolerable than single-agent chemotherapy for the treatment of NSCLC in elderly patients with good performance status 10. Conversely, another metanalysis found that elderly patients treated with doublet therapy had a survival benefit but more grade 3 or 4 anemia, thrombocytopenia, and neurotoxicity toxicities than those treated with single-agent chemotherapy 11. These results are consistent with those from another metanalysis including 2,605 patients aged ≥70 years with advanced NSCLC, which showed that doublet chemotherapy significantly improved the overall response rate (but not overall survival) 12. However, toxicity was significantly more frequent in patients receiving doublets, as compared with single-agent therapy 13. Two ongoing open-label, multicentre, randomised phase III trials comparing the efficacy of a single-agent chemotherapy with cisplatin-based doublets in elderly patients with advanced NSCLC will provide more information on the feasibility of doublet chemotherapy in this setting 14. At present, single-agent chemotherapy is usually preferred in clinical practice, based on currently available data indicating that single-agent chemotherapy with vinorelbine, taxanes or gemcitabine is an effective treatment option for elderly patients with NSCLC, who often have comorbidities that could increase the risk of toxicity or contraindicate the use of doublet chemotherapy 15. In patients with advanced/metastatic disease, third-generation single-agent chemotherapy is considered the standard of care 16. Elderly patients with advanced NSCLC have a short life expectancy. As such, improving QoL is an important treatment goal in this patient population.In recent years the number of available oral cytotoxic agents has dramatically increased. Oral regimens provide advantages in terms of ease of administration and patient preference 17, with an efficacy similar to i.v. agents 18 , 19. As such oral treatments may represent a valuable alternative option, with the potential advantage of improving patients’ QoL. In the present trial we aimed to compare the effect on QoL of oral vinorelbine and i.v. gemcitabine in elderly patients with advanced NSCLC. Treatment acceptability was also evaluated. We conduct an observational, non-interventional, prospective, multicenter study conducted between January 2011 and June 2013. Seven centers in Sicily, Italy, were involved. Participating centers identified patients who were candidates for first-line treatment with intravenous (i.v.) gemcitabine or oral vinorelbine. The choice of treatment was independent of the study and was based solely on clinical judgment. Patients were considered eligible if they had histologically documented NSCLC, stage IIIB/IV disease, ≥70 years of age, Eastern Cooperative Oncology Group (ECOG) performance status (PS) 0-2 and if they had provided informed consent. Patients who had received previous chemotherapy or other anticancer therapies were excluded. The primary endpoint of the study was the change from baseline in global health status/QoL at the first time-point (i.e. after three cycles or two months). Secondary endpoints were change from baseline in other parameters of QoL, acceptability and satisfaction with oral vinorelbine. Treatment regimens consisted of i.v. gemcitabine 1000 mg/m2 or oral vinorelbine 60 mg/m2 on days 1 and 8.Each cycle was repeated every 21 days until disease progression or severe toxicity/patient withdrawal. Chemotherapy-related adverse events were classified according to WHO toxicity grading criteria for anticancer drugs 20. QoL was assessed with the European Organization for Research and Treatment of Cancer (EORTC) quality of life questionnaire QLQ-C30 version 3.0 21 and the lung cancer module QLQ-LC13, a specific tool designed for use among lung cancer patients receiving treatment with chemotherapy or radiotherapy 22. Both questionnaires include multi-item scales and single-item measures (score 0-100). In QLQ-C30, a high score for global health status/QoL and functional scales (Physical, Role, Emotional, Cognitive and Social Functioning) indicates a high quality of life, whereas a high score for a symptom scale (Fatigue, Pain, Nausea/Vomiting, Dyspnoea, Insomnia, Appetite loss, Constipation, Diarrhoea or Financial difficulties) indicates a high level of symptoms. The scoring system for the QLQ-LC13 is identical to that for the symptom scales/single items of the QLQ-C30. Both questionnaires were administered at baseline and every 3 cycles (or 2 months). Treatment acceptability was assessed using a questionnaire specifically designed by our group. A social worker and a psychologist took part in the development process of the questionnaire, which included questions aimed to assess patient’s satisfaction with the information received on the oral treatment, patient’s opinion on efficacy, propensity for side effects and feasibility of the oral treatment, and patient’s self-assessed adherence to oral treatment. Data were assessed for normality using the Shapiro-Wilk test. The Student’s t test for unpaired data or the Mann-Whitney U test were used to compare baseline patient carachteristics, as appropriate. The Student’s t test for paired data or the Wilcoxon signed rank test were used for assessing differences from baseline in the QLQ-C30 and QLQ-LC13 scores. Statistical significance was set at p < 0.05. Descriptive statistics were used for describing the results of the questionnaire on oral chemotherapy. Data are presented as mean±standard deviation (SD) or as median (interquartile range [IQR]), as appropriate. All statistical analyses were performed using SPSS v.18.0 (IBM Corp., Armonk, NY, USA). One hundred and twenty-eight patients were enrolled and 106 (eighty males and twenty-six females) were evaluable for the analyses. Baseline characteristics of patients were comparable, except for cognitive functioning, pain, insomnia, appetite loss, constipation and financial difficulties, which were worse in patients who received oral vinorelbine (Table 1). Mean age was 77.1 years, 58% of patients had a histological diagnosis of adenocarcinoma and 37% of squamous carcinoma. The majority of patients had ECOG PS 0-1 (0=25.5%; 1=63.3%; 2=12.3%). Twenty-two patients dropped out of the study due to early progression of disease (n=18) or death from other cause. Fifty two patients received first-line treatment with i.v. gemcitabine and 54 were treated with oral vinorelbine. All patients completed the QoL questionnaires (EORTC QLQ-C30 and QLQ-LC13) at baseline. However, not all patients were maintained on the same treatment regimen over the study period, due to progression or toxicity. Patients who had a change of treatment were not considered evaluable for the purpose f the present study. Eighty-five patients (38 in the gemcitabine group and 47 in the vinorelbine group) completed the questionnaires after three cycles of treatmentand only 34 (11 in the gemcitabine group and 23 in the vinorelbine group) were administered the questionnaires after six cycles. Therefore, only the first and second administrations of the questionnaire were used in this analysis. A significant improvement from baseline in global health status/QoL was observed in patients treated with oral vinorelbine (p < 0.05 versus baseline), but not in those receiving i.v. gemcitabine (Figure 1A). 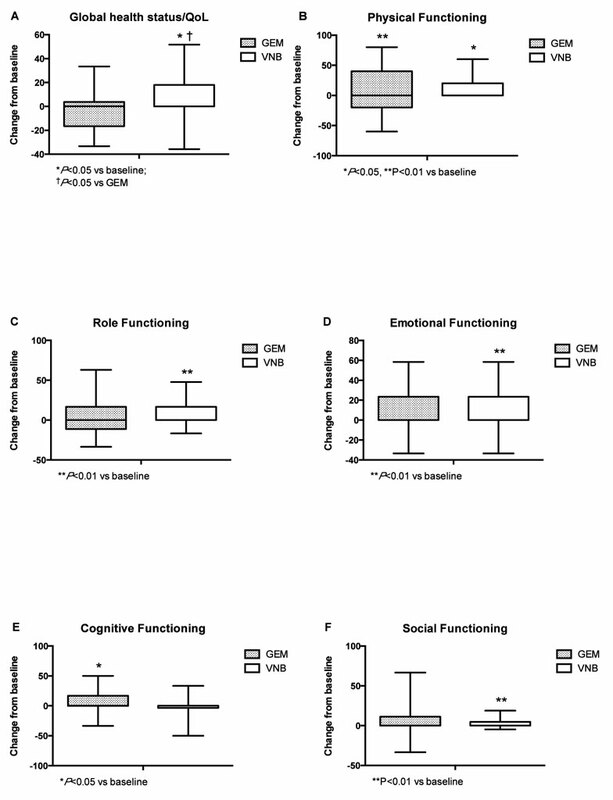 Significant improvements were also observed in the Physical Functioning scale with both treatments (Figure 1B), in the Cognitive Functioning scale with gemcitabine only (p < 0.05) (Figure 1 E) and in the Role Functioning, Emotional Functioning and Social Functioning scales with oral vinorelbine only (p < 0.01 for all) (Figure 1C, 1D and 1F). Figure 1. QLQ-C30 functional scales. With regard to symptom scales, significant improvements were observed in fatigue and pain with both treatments (Figure 2A and 2C). 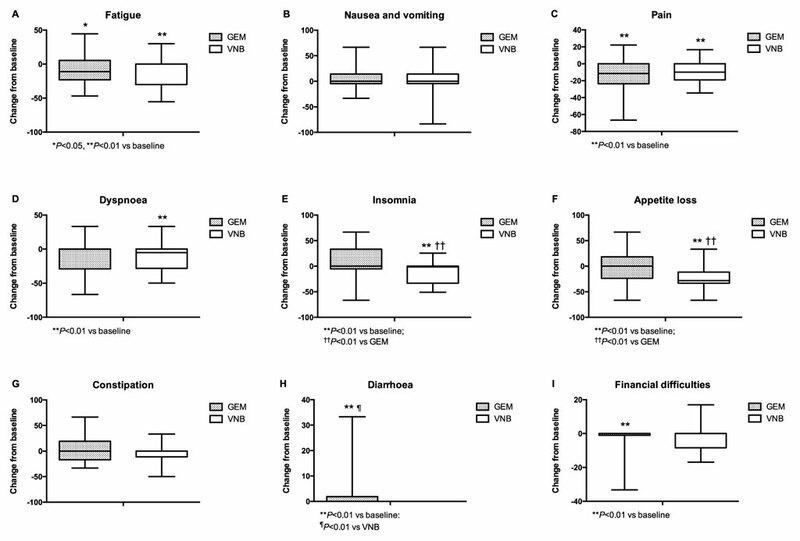 Gemcitabine was associated with a significant improvement financial difficulties and it’s possible that the idea of patients being treated with gemcitabine shows an awareness of the importance of care and therefore access to the hospital, but also with significantly worsening of diarrhoea (Figure 2H and 2I). Only patients treated with oral vinorelbine showed a significant improvement in dyspnoea and a marked decrease in both insomnia and appetite loss (Figure 2D, 2E and 2F). Nausea and vomiting and constipation were not significantly affected by either treatment. Figure 2. QLQ-C30 symptom scales. 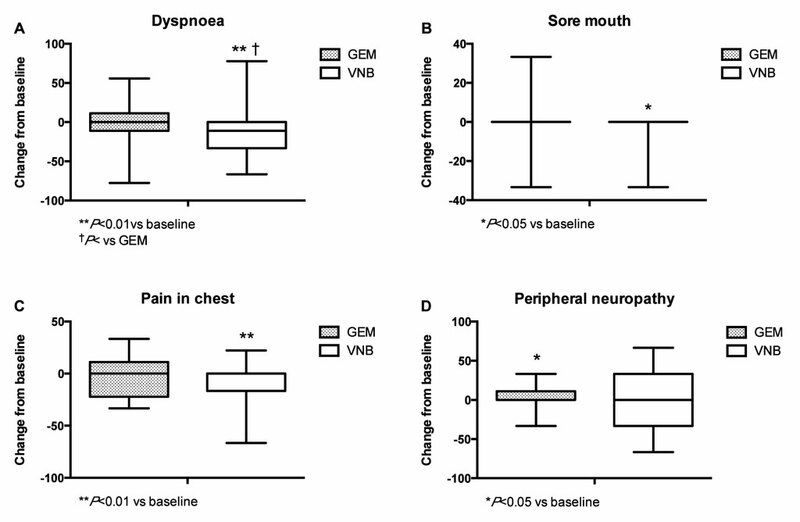 Patients treated with oral vinorelbine showed significant improvements in dyspnoea (p < 0.01), sore mouth (p < 0.05) and pain in chest (p < 0.01) (Figure 3). Conversely, peripheral neuropathy significantly worsened in patients treated with i.v. gemcitabine (p < 0.05). 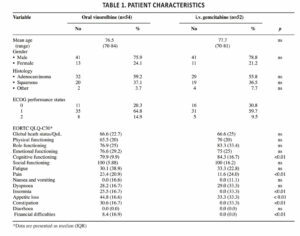 At baseline, the 54 patients treated with oral vinorelbine were administered a 11-item questionnaire specifically developed to bring out the patient’s attitude and perception towards oral chemotherapy, as well as the level of acceptance of this regimen. All patients were satisfied with the information received by the oncologist, and thought that oral chemotherapy had several advantages over i.v. treatment, namely the possibility of spending more time with family and friends, less time spent in hospital, no need for bulky infusion devices. The majority of patients (88.8%) believed that oral chemotherapy has the same efficacy as other chemotherapy regimens and almost all (90.7%) thought that oral chemotherapy may be associated with less adverse events. Futhermore, 92.5% of patients thought that oral chemotherapy could be easily managed, even when taken with other drugs for comorbid conditions. Both treatments were well tolerated. The percentage of patients experiencing an adverse event tended to be higher in the i.v. gemcitabine group. The most common grade 3-4 chemotherapy-related adverse events were neutropenia, anemia and constipation in the vinorelbine group and neutropenia, thrombocytosis and anemia in the gemcitabine group (Table 2). In the present study we sought to assess whether oral chemotherapy may have an advantage over intravenous chemotherapy in terms of QoL in elderly patients with advanced NSCLC. Patients treated with vinorelbine showed significant improvements in global health status/QoL and several functional and symptom scales compared with those treated with gemcitabine. Furthermore, vinorelbine was associated with improvements in dyspnoea, sore mouth and pain chest, as assessed with the lung cancer module QLQ-LC13. These results suggest that oral vinorelbine may offer advantages over i.v. gemcitabine with regard to quality of life. In addition, oral chemotherapy showed high patient acceptability, which is in line with previous observations from other groups 23 , 24 , 25 , 26 , 27. In elderly NSCLC patients aged 70 years or older, i.e. the majority of patients at diagnosis 28, improving quality of life, represents one of the main objectives of anticancer treatment. Elderly patients often have comorbidities and poor performance status, which heavily impacts the choice of treatment. Fit elderly patients (High ADL and/or IADL on CGA) with NSCLCmay be considered for treatments similar to those used in younger patients 29 , 30. 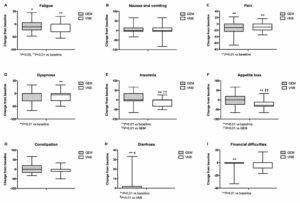 Conversely, elderly patients with multiple comorbidities are more likely to experience treatment-related toxicity, and using single-agent chemotherapytaking into account the expected toxicity profile of the agent, pharmacokinetics, organ function and co-morbidities may be more appropriate in this setting 31 , 32. In frail patients (Low ADL and/or IADL on CGA) with advanced disease, best supportive care (BSC) or individualized approaches should be considered. In elderly patients with limited life expectancy and advanced disease, QoL becomes an essenial aspect of care, and should therefore represent one of the measurable endpoints of efficacy studies.In 1999, the Elderly Lung Cancer Vinorelbine Italian Group Study (ELVIS) demonstrated that vinorelbine significantly improved survival and ameliorated QoL in elderly patients with advanced NSCLC as compared with BSC 33. In the ELVIS trial QoL was measured using the EORTC core questionnaire (QLQ-C30) and the lung cancer-specific module QLQ-LC13. Results of the QoL analysis showed that EORTC functioning scales were consistently better in patients receiving vinorelbine than in the control group, although statistical significance was reached only for cognitive function. Vinorelbine-treated patients had a better score than controls for some specific items related to lung cancer symptoms. Oral vinorelbine has been shown to be at least as effective as i.v. vinorelbine 34. The results of our study indicate that oral vinorelbine, similarly to the i.v. formulation, may also determine a relevant gain in QoL and may therefore represent a suitable treatment options for elderly patients with advanced NSCLC who are candidates for single-agent chemotherapy. Oral cytotoxic drugs are generally better accepted than other chemotherapy regimens by patients with cancer 35 , 36. It has been reported that patients treated with oral vinorelbine spend less time in hospital and 33% less time in pharmacy compared to patients treated with i.v. vinorelbine 37. In addition, oral vinorelbine may have an economic advantage over i.v. drugs, mainly due to the reduction in hospital resource utilisation provided by self-administration at home 38. Targeted oral drugs such as gefitinib and erlotinib have been also evaluated in older patients.A phase II randomized trial compared gefitinibwith i.v. vinorelbine as first-line treatment for advanced NSCLC in elderly patients 39. There was no significant difference between the two treatments in terms of efficacy, although gefitinib was better tolerated. Unexpectedly, individuals who were epidermal growth factor receptor (EGFR)-positive benefited more from vinorelbine than from gefitinib. Overall QoL and pulmonary symptoms wereimproved by gefitinib comparedto vinorelbine (by 24.3% and 36.6% versus 10.9% and 31%, respectively). In chemotherapy-naïve patients aged ≥70 years with NSCLC, erlotinibtreatment resulted in a response rate of 10%, stable disease in 41% of patients, improvements in QLQ-LC13 symptom scales (dyspnoea, cough, fatigue, pain) and an overall survival of 10.9 months 40. Oral vinorelbine has an efficacy comparable to that of the i.v. formulation and has demonstrated favorable tolerability, with a high degree of acceptance by both patients and physicians. When given at 60 mg/m2/week, oral vinorelbine exhibits the same efficacy as i.v. vinorelbine in terms of objective response rate, progression free survival, and overall survival 41. Bourgeois et al 42demonstrated the bioequivalence of exposure between oral and i.v. vinorelbine. It has also been suggested that oral administration may resultin better tolerability 43. This appears as a relevant aspect, particularly when considering QoL as an important treatment goal. Therefore, first-line treatment with oral vinorelbine might represent an effective therapeutic option for advanced NSCLC in elderly patients who cannot betreated with a combination schedule. 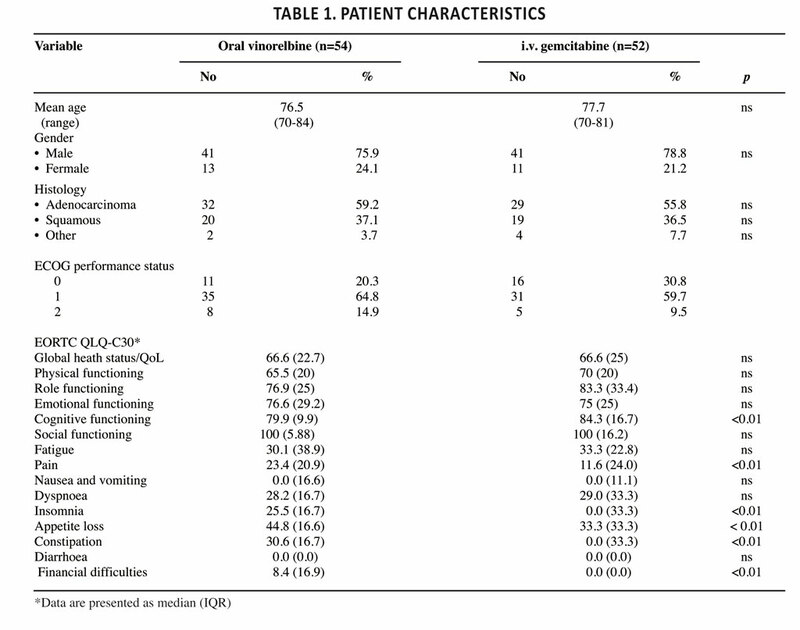 Although the relative small number of patients enrolled and the observational nature of the study do not allow us to draw solid conclusions, the results of our study strongly suggest that oral vinorelbine might offer significant improvements in QoL, significant in the Role Functioning, Emotional Functioning and Social Functioning scales of QLQ C30 (p < 0.01 for all). Also with regard to symptom scales, improvements were observed in the patients treated with oral vinorelbine, in dyspnoea (p < 0.01), sore mouth (p < 0.05) and chest pain (p < 0.01), allassessed by the QLQ-LC13 questionnaire. Treatment with oral vinorelbine was also well tolerated and associated with high patient satisfaction rates. Considering the enormous impact of eledrly cancer patients in the 3rd millenium 44 , 45 , 46 , 47, further studies are needed to confirm our results, and to assess aspects of oral cancer therapies that have not been fully evaluated in this and previous clinical trials, e.g. treatment adherence. In elderly patients, this issue is probably even more relevant, due both to the presence of several comorbidities that often require polypharmacy and to geriatric conditions that may impair the ability of managing treatment at home 48. In elderly patients with advanced NSCLC the identification of the best treatment-related quality of life becomes the main discriminating endpoint. Single-agent chemotherapy represents a valuable option, especially in unfit patients. Oral vinorelbine may provide an advantage in terms of patient preferenceas as regards the control of symptoms, with an efficacy comparable to i.v. formulations and with an acceptable toxicity profile. Owonikoko TK, Ragin CC, Belani CP, Oton AB, Gooding WE, Taioli E, Ramalingam SS. Lung cancer in elderly patients: an analysis of the surveillance, epidemiology, and end results database. J Clinl Oncol 2007; 25: 5570-5577. Howlader N, Noone AM, Krapcho M, Garshell J, Neyman N, Altekruse SF, Kosary CL, Yu M, Ruhl J, Tatalovich Z, Cho H, Mariotto A, Lewis DR, Chen HS, Feuer EJ, Cronin KA (eds). SEER Cancer Statistics Review, 1975-2010, National Cancer Institute. Bethesda, MD, http://seer.cancer.gov/csr/1975_2010/, based on November 2012 SEER data submission, posted to the SEER web site, April 2013. Azzoli CG, Baker S Jr, Temin S, Pao W, Aliff T, Brahmer J, Johnson DH, Laskin JL, Masters G, Milton D, Nordquist L, Pfister DG, Piantadosi S, Schiller JH, Smith R, Smith TJ, Strawn JR, Trent D, Giaccone G; American Society of Clinical Oncology. Clinical Practice Guideline update on chemotherapy for stage IV non-small-cell lung cancer. J Clinl Oncol 2009; 27(36): 6251-6266. Meoni G, Cecere FL, Lucherini E, Di Costanzo F. Medical treatment of advanced non-small cell lung cancer in elderly patients: a review of the role of chemotherapy and targeted agents. J Geriatr Oncol 2013; 4(3): 282-290. Lim KH, Lee HY, Song SY. Efficacy and feasibility of gemcitabine and carboplatin as first-line chemotherapy in elderly patients with advanced non-small cell lung cancer. Chinese medical journal 2013; 126(24): 4644-4648. Pereira JR, Cheng R, Orlando M, Kim JH, Barraclough H. Elderly subset analysis of randomized phase III study comparing pemetrexed plus carboplatin with docetaxel plus carboplatin as first-line treatment for patients with locally advanced or metastatic non-small cell lung cancer. Drugs R D 2013; 13(4): 289-296. Comella P, Frasci G, Carnicelli P, Massidda B, Buzzi F, Filippelli G, Maiorino L, Guida M, Panza N, Mancarella S, Cioffi R. Gemcitabine with either paclitaxel or vinorelbine vs paclitaxel or gemcitabine alone for elderly or unfit advanced non-small-cell lung cancer patients. Br J Cancer 2004; 91(3): 489-497. Gridelli C, Perrone F, Gallo C, Cigolari S, Rossi A, Piantedosi F, Barbera S, Ferraù F, Piazza E, Rosetti F, Clerici M, Bertetto O, Robbiati SF, Frontini L, Sacco C, Castiglione F, Favaretto A, Novello S, Migliorino MR, Gasparini G, Galetta D, Iaffaioli RV, Gebbia V; MILES Investigators. Chemotherapy for elderly patients with advanced non-small-cell lung cancer: the Multicenter Italian Lung Cancer in the Elderly Study (MILES) phase III randomized trial. J Natl Cancer Inst 2003; 95(5): 362-372. Quoix E, Zalcman G, Oster JP, Westeel V, Pichon E, Lavolé A, Dauba J, Debieuvre D, Souquet PJ, Bigay-Game L, Dansin E, Poudenx M, Molinier O, Vaylet F, Moro-Sibilot D, Herman D, Bennouna J, Tredaniel J, Ducoloné A, Lebitasy MP, Baudrin L, Laporte S, Milleron B; Intergroupe Francophone de Cancérologie Thoracique.Carboplatin and weekly paclitaxel doublet chemotherapy compared with monotherapy in elderly patients with advanced non-small-cell lung cancer: IFCT-0501 randomised, phase 3 trial. Lancet 2011; 378(9796): 1079-1088. Xu CA, Chang ZY, Wang XJ, Qi HY. Doublets versus single-agent therapy as first-line therapy for elderly patients with advanced non-small cell lung cancer? A systematic review of randomised controlled trials. Int J Clin Pract 2013; 67(11): 1118-1127. Qi WX, Tang LN, He AN, Shen Z, Lin F, Yao Y. Doublet versus single cytotoxic agent as first-line treatment for elderly patients with advanced non-small-cell lung cancer: a systematic review and meta-analysis. Lung 2012; 190(5): 477-485. Des Guetz G, Uzzan B, Nicolas P, Valeyre D, Sebbane G, Morere JF. Comparison of the efficacy and safety of single-agent and doublet chemotherapy in advanced non-small cell lung cancer in the elderly: a meta-analysis. Crit Rev Oncol Hematol 2012; 84(3): 340-349. Gridelli C, Rossi A, Di Maio M, Leo S, Filipazzi V, Favaretto AG, Burgio MA, Cinieri S, Bianco R, Ciardiello F, Cavanna L, Bordonaro R, Costanzo R, Sandomenico C, Gallo C, Perrone F, Morabito A Rationale and design of MILES-3 and MILES-4 studies: two randomized phase 3 trials comparing single-agent chemotherapy versus cisplatin-based doublets in elderly patients with advanced non-small-cell lung cancer. Clin Lung Cancer 2014; 15(2): 166-170. Pallis AG, Gridelli C, van Meerbeeck JP, Greillier L, Wedding U, Lacombe D, Welch J, Belani CP, Aapro M. EORTC Elderly Task Force and Lung Cancer Group and International Society for Geriatric Oncology (SIOG) experts’ opinion for the treatment of non-small-cell lung cancer in an elderly population. Ann Oncol 2010; 21(4): 692-706. Liu G, Franssen E, Fitch MI, Warner E. Patient preferences for oral versus intravenous palliative chemotherapy. J Clinl Oncol 1997; 15(1): 110-115. Franklin HR, Simonetti GP, Dubbelman AC, ten Bokkel Huinink WW, Taal BG, Wigbout G, Mandjes IA, Dalesio OB, Aaronson NK. Toxicity grading systems. A comparison between the WHO scoring system and the Common Toxicity Criteria when used for nausea and vomiting. Ann Oncol 1994; 5(2): 113-117. Aaronson NK, Ahmedzai S, Bergman B, Bullinger M, Cull A, Duez NJ, Filiberti A, Flechtner H, Fleishman SB, de Haes JC. The European Organization for Research and Treatment of Cancer QLQ-C30: a quality-of-life instrument for use in international clinical trials in oncology. J Natl Cancer Inst 1993; 85(5): 365-376. Bergman B, Aaronson NK, Ahmedzai S, Kaasa S, Sullivan M. The EORTC QLQ-LC13: a modular supplement to the EORTC Core Quality of Life Questionnaire (QLQ-C30) for use in lung cancer clinical trials. EORTC Study Group on Quality of Life. Eur J Cancer 1994; 30A(5): 635-642. Borner MM, Dietrich D, Stupp R, Morant R, Honegger H, Wernli M, Herrmann R, Pestalozzi BC, Saletti P, Hanselmann S, Müller S, Brauchli P, Castiglione-Gertsch M, Goldhirsch A, Roth AD. Phase II study of capecitabine and oxaliplatin in first- and second-line treatment of advanced or metastatic colorectal cancer. J Clinl Oncol 2002; 20(7): 1759-1766. Atagi S, Kawahara M, Yokoyama A, Okamoto H, Yamamoto N, Ohe Y, Sawa T, Ishikura S, Shibata T, Fukuda H, Saijo N, Tamura T; Japan Clinical Oncology Group Lung Cancer Study Group. Thoracic radiotherapy with or without daily low-dose carboplatin in elderly patients with non-small-cell lung cancer: a randomised, controlled, phase 3 trial by the Japan Clinical Oncology Group (JCOG0301). Lancet Oncol 2012; 13(7): 671-678. Coate LE, Massey C, Hope A, Sacher A, Barrett K, Pierre A, Leighl N, Brade A, de Perrot M, Waddell T, Liu G, Feld R, Burkes R, Cho BC, Darling G, Sun A, Keshavjee S, Bezjak A, Shepherd FA. Treatment of the elderly when cure is the goal: the influence of age on treatment selection and efficacy for stage III non-small cell lung cancer. J Thorac Oncol 2011; 6(3): 537-544. Glotzer OS, Fabian T, Chandra A, Bakhos CT. Non-small cell lung cancer therapy: safety and efficacy in the elderly. Drug, healthcare and patient safety 2013; 5: 113-121. Effects of vinorelbine on quality of life and survival of elderly patients with advanced non-small-cell lung cancer. The Elderly Lung Cancer Vinorelbine Italian Study Group. Journal of the National Cancer Institute 1999; 91(1): 66-72. Jassem J, Ramlau R, Karnicka-Młodkowska H, Krawczyk K, Krzakowski M, Zatloukal P, Lemarié E, Hartmann W, Novakova L, O’Brien M, Depierr A. A multicenter randomized phase II study of oral vs. intravenous vinorelbine in advanced non-small-cell lung cancer patients. Ann Oncol 2001; 12(10): 1375-1381. Taylor H, Burcombe R, Hill S, Cadwallader S, R J. Assessing the impact on staff resource and patient waiting time of a switch from IV to oral chemotherapy: time and motion model for HTAs. Value Health 2005; 8(6): A45. Le Lay K, Myon E, Hill S, Riou-Franca L, Scott D, Sidhu M, Dunlop D, Launois R. Comparative cost-minimisation of oral and intravenous chemotherapy for first-line treatment of non-small cell lung cancer in the UK NHS system. Eur J Health Econ 2007; 8(2): 145-151. Crinò L, Cappuzzo F, Zatloukal P, Reck M, Pesek M, Thompson JC, Ford HE, Hirsch FR, Varella-Garcia M, Ghiorghiu S, Duffield EL, Armour AA, Speake G, Cullen M. Gefitinib versus vinorelbine in chemotherapy-naive elderly patients with advanced non-small-cell lung cancer (INVITE): a randomized, phase II study. J Clinl Oncol 2008; 26(26): 4253-4260. Jackman DM, Yeap BY, Lindeman NI, Fidias P, Rabin MS, Temel J, Skarin AT, Meyerson M, Holmes AJ, Borras AM, Freidlin B, Ostler PA, Lucca J, Lynch TJ, Johnson BE, Jänne PA. Phase II clinical trial of chemotherapy-naive patients > or = 70 years of age treated with erlotinib for advanced non-small-cell lung cancer. J Clinl Oncol 2007; 25(7): 760-766. Bourgeois H, Vermorken J, Dark G, Jones A, Fumoleau P, Stupp R, Tourani JM, Brain E, Lefresne F, Nguyen L. Proven bioequivalence of blood exposure between vinorelbine 80 mg/m2 oral and 30 mg/m2 IV doses in cancer patients. J Clinl Oncol 2005; 23(16S): 2028. Tralongo P, Di Mari A, Agueli R, Gebbia V. Oral vinorelbine may not induce acute pain at the tumor site. J Pain Symptom Manage 2006; 32(3): 197-199. Bearz A, Berretta M, Lleshi A, Berto E, Tirelli U. Treatment of elderly patients affected by lung cancer: why to treat, when to treat and what we know. Anticancer Agents Med Chem 2013; 13(9): 1378-1382. Bearz A, Berretta M, Lleshi A, Tirelli U. Target therapies in lung cancer. J Biomed Biotechnol 2011; 2011: 921231. Bearz A, Garassino I, Tiseo M, Caffo O, Soto-Parra H, Boccalon M, Talamini R, Santoro A, Bartolotti M, Murgia V, Berretta M, Tirelli U. Activity of Pemetrexed on brain metastases from Non-Small Cell Lung Cancer. Lung Cancer 2010; 68(2): 264-268. Berretta M, Di Francia R, Tirelli U. The new oncologic challenges in the 3RD millennium. WCRJ 2014; 1(1): e133. Bordonaro S1, Raiti F, Di Mari A, Lopiano C, Romano F, Pumo V, Giuliano SR, Iacono M, Lanteri E, Puzzo E, Spada S, Tralongo P. Active home-based cancer treatment. J Multidiscip Health 2012; 5: 137-143.